The Montelores Early Childhood Council’s 6th annual Early Childhood Appreciation Dinner was held on May 27th at the Elks Lodge in Cortez, CO with almost 100 people in attendance. The theme this year was Building Excellence in Early Childhood, and the creativity of the MECC staff members who planned and decorated was unsurpassed. As attendees entered, they had photos taken in front of a mock city skyline, posing as either Rosie the Riveter or Godzilla. Entering the dining room, they were treated to a very awesome construction cake, and table decorations echoing the theme with trays of dirt and earth mover toys. Susan Lucas was nominated by the parents of the kids she teaches and received the Master Gardener Teacher of the Year Award. For all his great work highlighting the activities and philosophy of the Montelores Early Childhood Council and the importance of the early years, Tom Yoder of KSJD received the Voice for the Vulnerable Award. Many center directors shouted out praises for the hard work of everyone in their centers. Tables played creative team games, using unusual materials to create unique stories. It was a wonderful time. 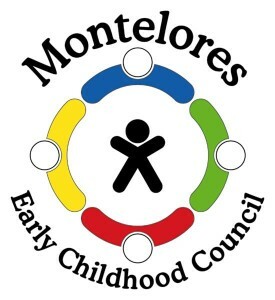 The Montelores Early Childhood Council’s fifth annual EC Appreciation Dinner was held on May 28, 2014, at the Elks Lodge. The 75 attendees had a ball, as you can see from the pictures. From table skits, to happy socializing, to many special awards, this was a chance for early childhood professionals to be honored and recognized for all the wonderful work they do for children and families in our communities. Thanks to everyone who attended, as well as the amazing MECC staff members whose hard work helped make this event a huge success! MECC hosted early childhood professionals for our annual Appreciation Dinner at the Farm Bistro. We had good food, good fun, good company and conversation, and many awards. This event is a chance for busy early childhood professionals to get together and share new ideas, get support, and be recognized for the outstanding work they do for young children and families in our community.